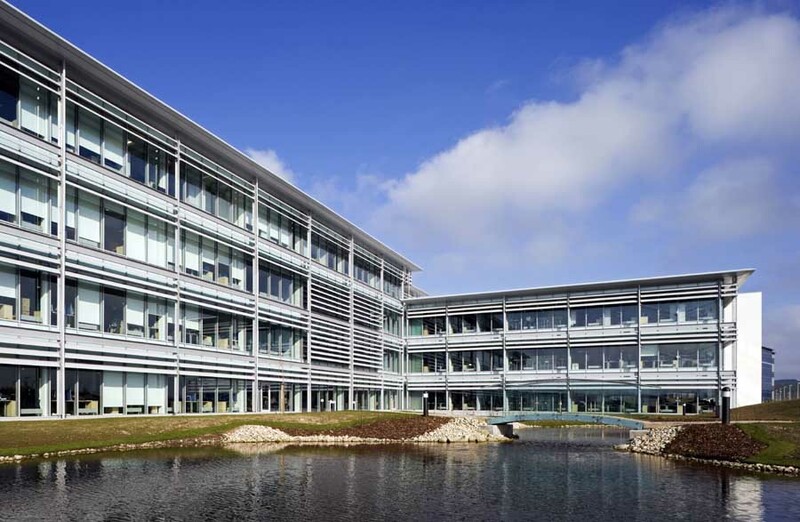 Designed by Michael Gilmour Associates, the campus development for one of the world’s leading subsea engineering and construction companies, Subsea 7, brings together over 800 staff on the edge of the countryside at Westhill, on the outskirts of Aberdeen. The development was completed late in 2008 and has allowed Subsea 7 to consolidate its existing bases around Aberdeen at Dyce, Westhill and Tullos. 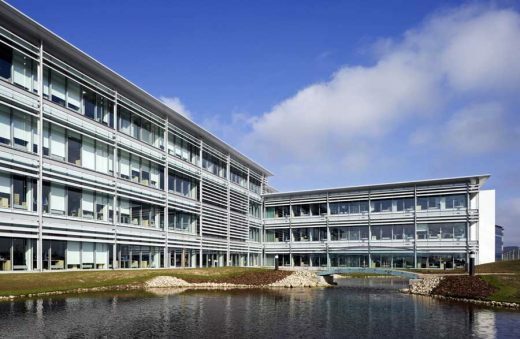 The building was planned from the outset to achieve a “Very Good” BREEAM rating signifying its environmental credentials, and consists of around 14,000sq.m. of accommodation, spread over four storeys and distributed between wings which are arranged in a pinwheel plan. The development was conceived as a working village, with its own High Street and Village Square. A linear atrium runs through its heart, and is used as the main circulation route or “High Street”. There are a couple of squares along the route, one being the main reception, the other a dining and presentation area or “Village Square”. This tiered restaurant can spill out onto an external terrace during good weather. In fact, Subsea 7’s staff are encouraged to make use of the parkland landscaping, which extends beyond the building’s perimeter during lunch breaks and company functions and allows the occupiers to exercise or just relax in peace and quiet. 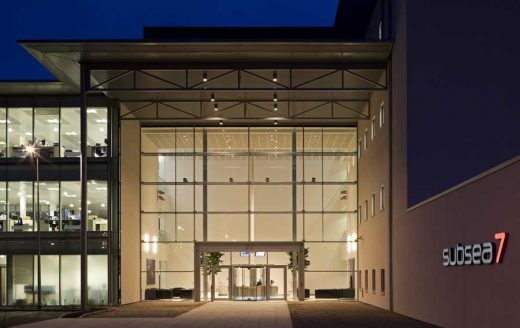 The working areas of the Subsea 7 building are broken down into discrete elements, each of which is connected directly to the High Street and Square, encouraging casual meetings between separate groups. This arrangement also allows for future flexibility whereby parts can be added to, whilst breaking down the apparent scale of the overall development. Open galleries, glass balustrades and fully glazed offices make the most of this unique space, orientating each part towards the building’s High Street, and revealing its functions to visitors. Similarly, the combination of shallow plan wings, and the street-like atrium with its fully-glazed roof, means that staff at Subsea 7 are never more than nine metres distant from natural light – an important factor in creating a healthy environment. Acting as a counterpoint to the sheer skin of curtain walling around the atrium is the building’s envelope: it is clad in neutral solar-control glass, with giant brises soleils which control solar heat gains and glare. These passive energy measures, along with a displacement ventilation system and chilled beam cooling, are key means of reducing energy consumption. Hopes for the building’s success in forthcoming design awards are high, and the scheme has already attracted favourable comments from its users and visitors. Michael Gilmour Associates is a medium-sized architectural practice, established for thirty years and based in Aberdeen. MGA has a long track record in the industrial and commercial sectors, with many commissions for blue chip clients, including offshore oil companies. The practice has also pioneered zero-energy housing, with a first-in-Scotland housing project in Laurencekirk, Aberdeenshire which needs no central heating. Subsea7 is one of the world’s leading subsea engineering and construction companies servicing the oil and gas industry. With over 5,500 personnel, Subsea7 operates worldwide, focusing on undersea pipeline and umbilical systems, and using a fleet of Subsea 7 is one of the world’s leading subsea engineering and construction companies offering all the expertise and assets that make Subsea, Umbilical, Riser and Flowline (SURF) field development possible. With a multi-national workforce in excess of 5,000 people worldwide, the company’s global offshore operations are supported out of the North Sea, Africa, Brazil, North and Central America and Asia Pacific. technically advanced ships and ROV’s. “BREEAM” is an environmental assessment method development by the Building Research Establishment to measure a building’s overall impact on the environment.